Description of "Yoga And Yogic Powers"
YOGA AND YOGIC POWERS is the first book of its kind ever written on Yoga that provides such penetrating insight into the thinking, life and powers of the Hindu Yogis. It also tells the readers unknown facts about themselves which they must know, if they wish to remedy the cause of their physical, mental and emotional problems. The book is so profusely illustrated with examples, experiences and guidance from the author's own life, that the reader will not only find it a deeply fascinating study of the mind and its powers, but also a warm inspiring story of one of the great Yogis of India, who taught in the United States from 1954 to 2009. Yogi Gupta was the president of the Kailashananda Mission, in Rishikesh, India, whose principal aim is to promote greater friendship between the two great democracies - The Republic of the United States of America and The Republic of India. The author reveals the innermost thoughts of millions of Hindus, their way of life, and their mystic experiences, and by broadening and deepening the reader's understanding of them he thus prepares a fertile ground for greater friendship between the two great nations. Avoiding the dry scholarly approach to his subject, Yogi Gupta explains and shows in an impressively simple yet scientific way, how an average person today may utilize the principles of developing and releasing powers of the mind for more successful and harmonious living. This science of Mental Culture (Yogic Powers), which was practiced and perfected and taught by the ancient Yogis in India 6,000 years ago, is vividly expounded in such chapters as: The Miracles of the Mind, Psychic Anesthesia, Saints with Psychic Powers, Mind's and Soul's Life in Space, Your Guardian Angel, Impulsive Urge For Wrong Doing, Fame and Fortune by Psychic Means, Protective Aura against Psychic Attack, Supersensory Perception, The Materialization of Masters at Will and Their Controlling the World's Destiny, plus a Two Month Course in Psychic Phenomena and a Two Year Course in Divine Perception - with full page photographs of the author. The author was the director of the Yogi Gupta New York Center, held regular lectures, classes and offered personal guidance to his disciples on the Path. In connection with his teachings in the United States, where he has a large following, he presented this concise philosophy and these easy techniques of Yoga exercise to facilitate the comprehension and practice of Yoga in the West. 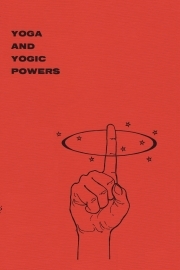 Reviews of "Yoga And Yogic Powers"